On a spur of the moment, I headed out for drinks and dinner with friends. It was a girl's night out at the Design District in Midtown Miami. The first choice was Michael's Genuine, but my friend who arrived first called me to report the bar was full. No surprise. And forget dinner. Without reservations, the wait is eternal. So in wandering the Design District we stumbled upon Mai Tardi. I just love pleasant surprises! This outdoor bar/restaurant (the outdoor restaurant is instantly housed under a white tent to protect from rainy weather), is an Italian casual spot for scenic alfresco dining. A vibrant green and turquoise mosaic wall borders the expansive 4,000 square foot piazza and welcomes diners to a cozy interior and contemporary decor. A handsome marble pizza bar and pizza oven instantly indicates their specialty. Pizza parlor galore! Our gastronomic group of girls desired different fare for dinner tonight but we enjoyed the Happy Hour specials while lounging on bamboo sofas-- beer for $5, wine for $6 and cocktails for $7 plus free tapas from 5pm until 7:30pm. We thoroughly enjoyed this chic, industrial yet earthy corner. As pictured above, hundred year old oak trees lined the middle of the patio like models on a catwalk--tall, elegant and stunning. While the bar crowd was thinning, the restaurant crowd was swelling. So we ambled over to another new restaurant, Spanish tapas style, Sra. Martinez. I highly recommend Mai Tardi for Happy Hour and can't wait to return for dinner. I heard the fried artichoke is a favorite and the dinner menu is affordable. In other words, one can afford to dine out more and enjoy this marvelous Miami weather with friends and visitors. Best of all an evening there is budget friendly all around. 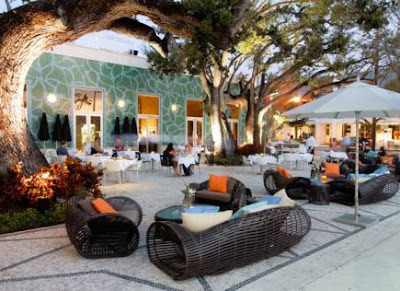 While South Beach gouges you for parking fees of $20, the Design District parking meters are only $2.00 from 6pm-midnight and valet is $3.00! Plus tip it's very reasonable. It's never too late to visit Mai Tardi as the name translates "never late" in Italian! How beautiful! And the restaurant looks nice too!